It is the year 3885. 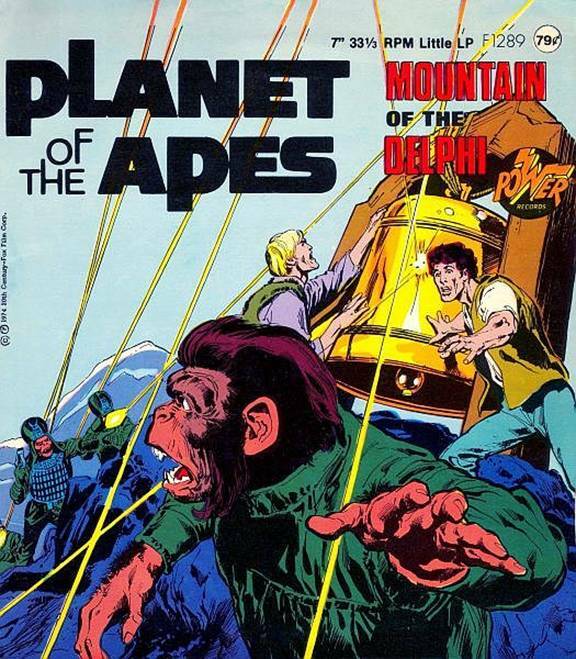 Two astronauts, Pete Burke and Alan Virdon, traveling through a time warp in space, find themselves stranded on a strange and hostile planet, where apes are the hunters and humans the hunted. Whew! That was close. Where's Galen? Right behind you. I'm no more anxious to be caught by General Urko's gorillas than you are. If there's anything he hates more than a human, it's an ape who is friendly to humans. They're going away. I don't get it! I don't either. They had US trapped. With them in front and this mountain at our backs, we didn't have a chance. What do you think, Galen? Why did they leave? Unless we have entered one of the Forbidden Zones. Out of a mixture of fear and superstition, our minister of science has designated certain areas of the country off limits to all apes. That's kinda strange, 'cause your Dr. Zauis doesn't strike me as being the kind to fall for a lot of superstitious bunk. Quite right. His major concern is to keep apes from learning that there may have been human civilizations in ancient times equal or perhaps even superior to our own. Thus upsetting the theory that apes evolved from a lower species of primates, the humans. How come you don't go along with him? I've seen evidence in archaeological research that such civilizations did indeed exist. Because I have tried to make that fact known, I have been denounced as a heretic and now I am a fugitive along with you. Lucky thing for us, too. We wouldn't be alive today if it weren't for you. Hey, this sure is a forbidding looking place. That mountain rising up out of no place, casting it's shadow over the valley below. Where are we, Galen? Look out! Those boulders! Coming right down at us. Let's get out of here! Wow! An avalanche. As if we hadn't gotten enough trouble dodging General Urko and his gorillas. Men! Cavemen! Right out of the Stone Age. Yes, yes! Just what I thought! But I never thought I'd have the good luck to see living specimens. Those humans. They could be the missing link between civilized apes and primeval humans. Oh...I'm sorry. I meant no offense. OK, OK. So what else do you know about them? They are called the Delphi. And this is the very mysterious Mountain of the Delphi. This mountain is an object of both fear and reverence to them. It is said they are drawn to it as though by a magnet. By a subconscious memory of something out of their dim past. Sure is strange - looking. Probably of volcanic origin or the result of some other cataclysmic restructuring of the Earth's surface. Dwelling in caves in and around the base, they never stray far from it. Legend speaks of a metallic object at the top, which they worship as a god, but dare not approach. Hey, look! There's one of those caves up there where the boulders came from. And there's another. Right there behind in the brush, and...uh oh. Suddenly, Alan, Pete and Galen find themselves surrounded by a primitive group of humans, staring at them. Silent. Impassive. Er, um. Hello. I'm Pete Burke. And these are my friends, Alan Virdon and Galen...? You don't seem to be getting through. Let me try. "We are friends. FRIENDS." Perhaps it is my presence that disturbs them, since in their eyes I am a member of the ape ruling class. "As a scientist, I can assure you that I consider humans as equals of apes and I wish to be a friend to all humans." Look at their expressions. Unchanged. Completely emotionless. They don't seem to understand a word we've said. On the contrary. I have understood every word that has been said. Well, thank heaven. One of you CAN speak. I am Tamarain, Guardian of the Delphi. Why have you come here? We seek refuge from the gorillas, nothing more. The mountain has been our refuge for uncounted generations. But we endanger our security and our future if we give aid to escaped slaves. We're not slaves, we're astronauts! We came from another planet, another world out there in space called Earth. Earth? Did you say Earth? At last! The Prophecy of the Delphi has been fulfilled. It is written that the survival of civilization is in the hands of men of Earth. And that one day they will descend from the skies to lead us to the land of promise, where all living things dwell together in unending peace and harmony. Amazing how that concept in one form or another appears in the tradition of so many and varied civilizations! Even among the apes. Though in our Book of Life it is an ape who will lead the way. Come! We must hurry. If the gorillas know of your origin you are in greater danger than I thought. Hey! Hold it. You're taking us up toward the spot where those boulders came down. How do we know it won't happen again? He is in charge of defense of the mountain. Young and impetuous and naturally suspicious of strangers. But you are safe. Just follow me. Up to the Great Hall of the Mountain, where my people gather in time of danger. Then you believe the gorillas will overcome their fear of the Forbidden Zone and come back? Yes, they will return. Your encounter was with a small scouting party. This time they will come with a large force. Perhaps led by General Urko himself! Our only safety is in the mountain. Tamarain was right. At that moment, General Urko was meeting with his captains and Dr. Zauis. You have heard the report of my scouts, Dr. Zauis. 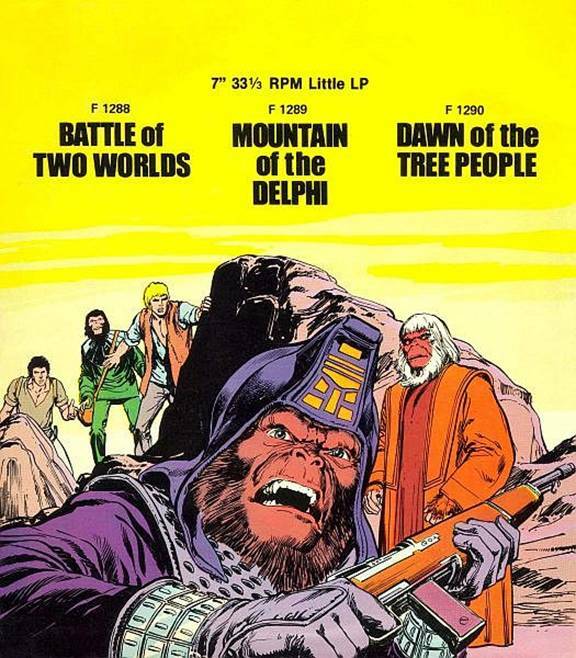 Burke and Virdon and the renegade Galen have taken refuge in or near the Mountain of the Delphi. They must be captured at all costs and the Delphi destroyed as a warning to the rest of the humans! For once, General, I am in complete agreement with you. As long as they were isolated we could tolerate the Delphi existence. Now that this isolation has been broken, the contagion of that place could spread throughout the land and destroy us all. The gorillas under my command are as brave as any, General Urko. But their fear of that mountain is great! Superstitious fools! I will lead the attack myself. We move out NOW! Follow me. NARRATOR: In the meantime, Tamarain and the three fugitiives approach the cave entrance leading to the Great Hall. Wow! Two hundred feet of sheer cliff behind us. Straight down! Yeah, and only one narrow footpath leading up here. With enough food and guns, this place could be held indefinitely. Come! We have no time to lose. Entering the cave single-file, they walk through a long, twisting tunnel. Rounding one last corner, they stop suddenly and gaze in amazement at the sight before them. (whistles) It's like a cathedral. No wonder they call it the Great Hall. And look there. Relics of an ancient civilization. A veritable treasure house of archaeological significance! Look here, Pete! Steel rails, and some cobblestones. And that thing,sticking up like a stalagmite. It's a steeple. The top of an old church! Way ahead of you. This mountain stands where once a great city stood. And the Delphi. This handful of primitive humans must be the descendants of the people of that city. Clinging to the mountain like a security blanket. Look. Tamarain's getting up on that pulpit. He's going to speak. Hear me, my people! This day have come among us three strangers, as foretold in the Book of Wonders. A - a - a - amen! This day is for us a day of glory, a day of deliverance. The people! They're NOT mutes. They're answering Tamarain like a congregation in a church. As it is written in the ancient scrolls of the Delphi: "When in the course..."
Tamarain! The gorillas are coming! A Whole army led by General Urko! Prepare all defenses! Bralok! Where is Bralok? Suddenly, a secret stone door swings open and Bralok enters the Great Hall. There is only one defense, Tamarain. Turn the strangers over to General Urko! What are you saying? Betray our friends? Never! He has given me his word that he will leave us in peace. You have spoken to him?! While you played at being a soldier, I acted. He waits at the foot of the mountain for your decision. You fool! General Urko will not keep his word! There is his answer! He followed you to the secret entrance. Then I am taking command. You are through, Tamarain. Turning to the open door behind him, Bralok shouts to the gorillas waiting below. Guards! Up here! The fugitives are up here! Leading them behind the pulpit, he points to a stairway carved out of stone. Follow those stairs to the top of the mountain. Go down the other side and you will find safety in the forst beyond. It is forbidden for any Delphi to approach the top of the mountain, home of Ytrebil. God of the Mountain, Protector of the Delphi. My trust is in him. It is written that in the time of our greatest danger, Ytrebil will speak and our enemies will be destroyed. Go! Now! Emerging in the light at the top of the mountain, the three friends peer cautiously over the edge. Far below, Urko, flushed with a sense of victory, shouts to his officers. Destroy the Delphi to the last man, woman and child. But I want those fugitives ALIVE! Uh oh! They've spotted us. Let's get out of here! Wait a minute! Alan, look at this! It's a huge, ancient bell. I estimate the weight at about 2,000 pounds, with a rim diameter of about 12 feet. The mountain is shaking! All that gunfire. Galen! Alan! Quick! Down here. With the mountain crumbling away, almost beneath their feet, they race down the side, reaching the safety of the forest, just as the proud home of the Delphi, with a final convulsive roar, dissolves into a massive heap of rubble, buried beneath a towering cloud of dust. Are you sure we didn't just DREAM there was a mountain there a few minutes ago? If it was a dream, then it was one dream that will never die. You speak in riddles. All I know is that the ruins of an ancient city, the richest archaeological treasures I have ever SEEN may be lost for all time! And all I know is that a great man and his people died there today, never knowing that the voice of their god of the mountain, silent for over 2000 years, was in fact the voice of the Liberty Bell! Of ancient Philadelphia.